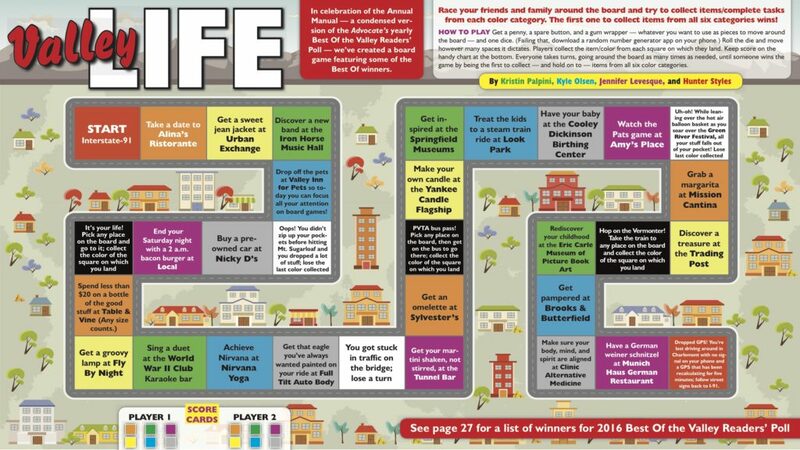 In celebration of the Annual Manual — a condensed version of the Advocate’s yearly Best of the Valley Readers’ Poll — we’ve created a board game featuring some of the Best Of winners. Race your friends and family around the board and try to collect items/complete tasks from each color category. The first one to collect items from all six categories wins! Click the image for a full-size printable game board, or scroll down to get right to the Annual Manual. HOW TO PLAY: Get a penny, a spare button, and a gum wrapper — whatever you want to use as pieces to move around the board — and one dice. (Failing that, download a random number generator on your phone.) Roll the die and move however many spaces it dictates. Players collect the item/color from each square on which they land. Keep score on the handy chart at the bottom. Everyone takes turns, going around the board as many times as needed, until someone wins the game by being the first to collect — and hold on to — items from all six color categories.